For some, turning their passion into a job can be tricky. But CEO Emeka Anen and his brother, marketing CMO Chis Anen, managed it with THRONE. The idea came to the brothers after Chis’ frustration for not being able to attend sneaker releases due to being busy with college and working as a DJ. 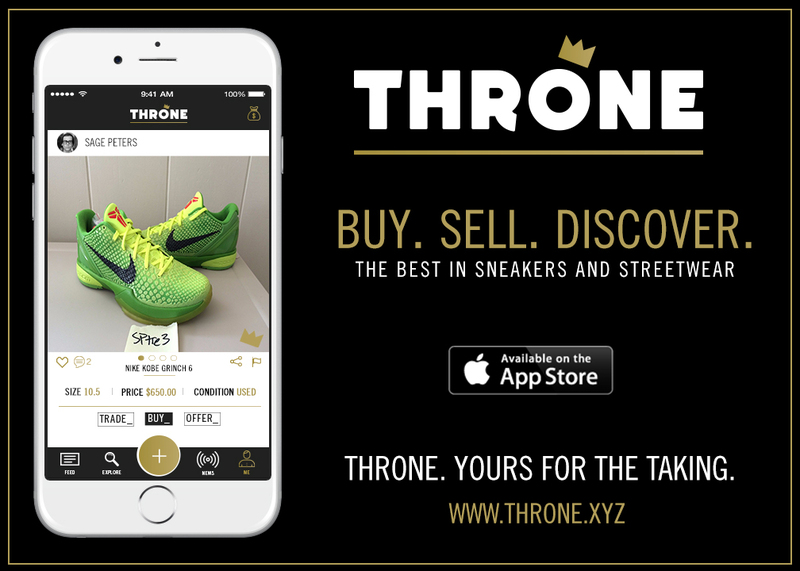 THRONE launched as a different brand, Instasneaks, just last year as a beta with around 10,000 users. It is a marketplace that facilitates the buying, selling, and discovery around sneakers and streetwear. Transaction between users is peer-to-peer. “We encourage users to build and digitize their existing lockers or streetwear or sneaker collections,” Emeka says. With the ever-rising popularity of sneakers and streetwear in today’s pop culture, “sneakerheads” (as fans are called) often use online marketplaces such as Ebay and Amazon to buy and sell sneakers. Some have gone to social media like Facebook, Twitter, and Instagram not only to buy and sell, but also to connect with other fans. “It’s a huge emerging market that’s really been untapped thus far,” says Chis. THRONE centralizes all this in one platform, and is easier and safer. “We’re building a community among the sneakerhead market,” Chis says. Products on THRONE are commission-based. Users who wish to sell simply need to take a photo of their product and upload it. They can also build wish lists of items they want and are notified if another user has such an item in the condition and size that they specified. THRONE can also organize their collection and tell them the value. With this model, THRONE can learn more about their user’s preferences and predict what it would mean for primary retailers, and what value the items are. Sneakers are also cataloged by models, nicknames, colors, etc., which also makes it easier to use for casual fans. The Anen brothers sees THRONE as a solution to some existing problems within the sneakerhead culture, such fans who wait long hours for the release of a new sneaker, only to go home disappointed because the product sold out quickly. As Instasneaks, they were ranked among the Top 50 sports-related apps several times in February. Following the rebranding, their social media following rises by 15% week after week, and were recently interviewed on HOT97 by DJ Ebro Darden. Their community growth only continues to show the increasing demand and interest for the product. And it will only continue growing.